In our work with global brands, we have seen that language quality works best when treated not as a step, but as a layer in localization processes. Maintaining high quality involves activities all along the way, not just at certain steps. We took a deeper look at the idea of the quality layer here. Now we are going to look at how you can get started and find the right level of customization to drive a quality layer, rather than working with an outdated step-based process. The first thing to say about language quality processes is that there is no need to go ‘all in’—certainly not all at once. But there are things you can do to evolve your quality processes immediately, and then raise the bar over time. This post will show you some of the different levels of quality checks, from the common “core” and high-priority checks, to the less critical (but incredibly powerful) checks worth considering. Once you understand this spectrum, you can start to plan your automated Linguistic Quality Assurance tool implementation and decide what kinds of customization are right for your needs both today and in the future. When we work with our clients, especially those who are starting out on their language quality journey, we guide them through the following process: from early consultancy and planning, through an initial quality process pilot, and on to continuous quality optimization. Discovery—Define your quality requirements; evaluate the available tools and select the right ones for you; define resource and cost expectations; set up your team. Preparation—Train your internal teams; create custom linguistic assets (like a glossary or style guide); evaluate the customization options for those assets that are available within your chosen Quality Assurance (QA) tools. Piloting—Help internal teams train external translators; focus on one or two languages to start; collect and implement feedback. Live—Kick off a culture of continuous improvement; control and monitor all quality programs going forward. We’ve been referring to quality as a layer in your localization processes. Now let’s take a look at the sections we call implementation levels. These implementation levels can act as a guide for brands when they are going through the above QA tools implementation plan. As a general rule, you start at the core and work your way to the outer levels as your quality programs mature or your needs develop. Implementation level 1: Common checks constitute the "core" of all QA tools implementations. This layer of QA tools is readily available "out-of-the-box" for all languages, and covers generic spelling mistakes, untranslated text, consistency at a segment level, adherence to country standards—stuff like that. 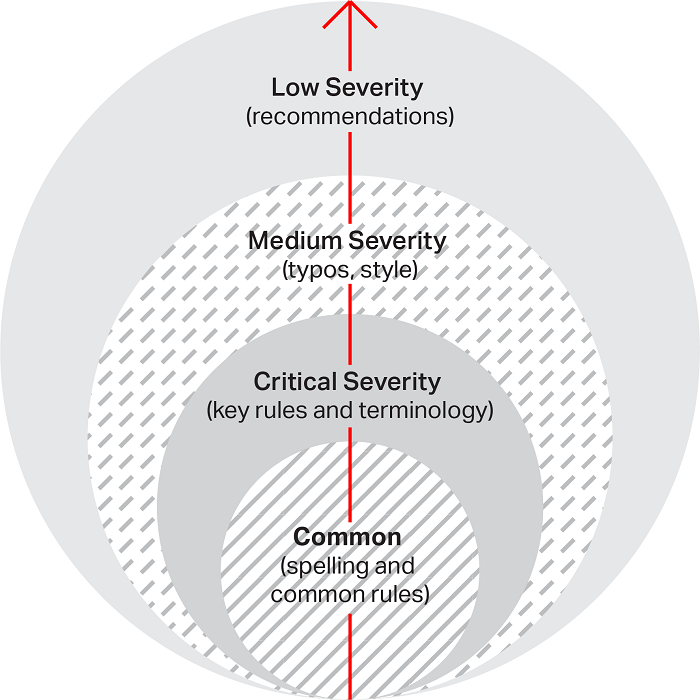 Implementation level 2: High-severity checks constitute a key layer of customization and include the most critical checks for a specific client. Think disastrous issues that can result in a product recall, cause legal issues or break your final build. Implementation level 3: Medium-severity checks are often optional or can be carried out when your quality program has reached a certain level of maturity. It includes checks like making sure typographical choices match style guide conventions, and the ability to build custom spell-checking dictionaries. Implementation level 4: Low-severity checks and recommendations are only implemented by brands that require a very thorough and precise approach to linguistic quality. Examples include using your preferred terminology or avoiding certain expressions. Focus on the “core” implementation level and the common checks it covers. Here, the need for customization is minimal, as most QA tools will do the job straight “out of the box”. Next, concentrate your efforts on just one or two priority languages. From there, as you scale up your efforts, you can start bringing in more languages. Then you can add the implementation level that covers critical, high-urgency quality checks. As you get a handle on your quality, repeat this process to implement additional levels. Establishing your quality layer is not only about tools, but also the knowledge and experience needed to choose the right ones. When you see the full spectrum of automated linguistic quality assurance tools available, and the levels of granularity to which your requirements for customization can go, it’s no surprise that many people are daunted by the prospect of quality management. But you don’t have to go it alone. If you are starting your quality journey—or looking to raise the bar—and need help making sense of your options, talk to us. Quality is our passion here at RWS Moravia. We can help you sort it all out and implement a customized quality solution to meet your customers’ needs.